alaTest has collected and analyzed 6334 reviews of GoPro Hero 3. The average rating for this product is 4.3/5, compared to an average rating of 4.0/5 for other Camcorders for all reviews. Comments about the portability and image quality are on the whole positive. The size and price also get good feedback. There are some negative comments about the zoom and viewfinder. The connectivity and battery get mixed reviews. We analyzed user and expert ratings, product age and more factors. 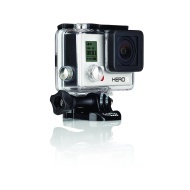 Compared to other Camcorders the GoPro Hero 3 is awarded an overall alaScore™ of 91/100 = Excellent quality. alaTest has collected and analyzed 242 user reviews of GoPro Hero 3 from Amazon.co.uk. The average user rating for this product is 4.4/5, compared to an average user rating of 4.0/5 for other Camcorders on Amazon.co.uk. Reviews about the portability and battery are generally positive. The image quality and price also get good feedback, whereas comments are divided on the memory. Some have doubts about the viewfinder and reliability. alaTest has collected and analyzed 2820 user reviews of GoPro Hero 3 from Amazon.com. The average user rating for this product is 4.2/5, compared to an average user rating of 3.9/5 for other Camcorders on Amazon.com. People really like the image quality and battery. The portability and price also get good comments. Opinions are divided on the memory, and many are critical about the connectivity and zoom. Smaller, lighter, sexier and twice as powerful the new GoPro HERO3 has been unleashed. The new GoPro Hero3 coming soon! GoPro's Hero3 White Edition takes over as our favorite action camera in the $200 price range, thanks to its sharp video quality and low price. Sharp 1080p video quality. Excellent value. Some purple fringing in footage. Narrow field of view in 1080p setting. Handy underwater enclosure; low distortion; good white balance. Sluggish; takes very soft images. The GoPro Digital Hero 3 is a cool idea that could be fun if you're swimming, but it's not useful for much else. The GoPro Hero 3 Silver and White editions are strong contenders in the sports-camera market, but the faster, more powerful Black Edition is head and shoulders the best sports camera on the market today.